If the energy and enthusiasm at this year’s annual Shoptalk event is any indication, retailers, brands, and other industry experts are rising to the incredible challenge of the fast-paced times we live in. No matter the vertical, those of us working in commerce are navigating tech disruptions, growing consumer demands, new policy and regulation speculations, and a sluggish outlook for US retail sales. But the insights shared among this week's 5K+ Shoptalk attendees prove that these hurdles are being met with incredible innovation and ingenuity. 1. Invest in new data technologies. There were several forward-looking ways showcasing how to put data to work, such as AI tech options like Amazon’s Alexa AI managing orders for Rebecca Minkoff products or Google Assistant, finding a specific type of shoes and sending driving directions to Google Home. In fact, Devin Wenig, president and CEO of EBay, went as far as to say to the crowd: "If you don’t have an artificial intelligence strategy, you are going to die." Jamie Iannone, President & CEO of SamsClub.com, said his company tracks customer purchase history to automatically create a cart of favorite products, recommends the right additional purchases at the right time and provides pick up solutions. The end result makes reorders (in Iannone's words) "magical"; customers can skip the in-person checkout line. At Salsify, we’re seeing that data science is key to taking digital merchandising to the next level. Our co-founder and CEO Jason Purcell shared the details of how data science in retail merchandising can work to support the future of shopping. 2. Put mobile first in your customer strategy. “Mobile isn’t just a technology; it’s a new customer behavior, ” said Nicolas Franchet, director of global vertical strategy at Facebook. The channel is an undeniable first stop for most consumers and a constant presence in shoppers lives. Jonathan Aferness, VP of product management for Shopping at Google, reported that 34% of all US purchases are taking place on mobile phones and nearly half (45%) of all customer journeys include the use of mobile. 3. Deliver great customer experience to win new marketshare. According to the Retail for Adobe's Customer Experience Retail Report Card, 57% of retailers plan to increase their budgets for personalization next year, rating it a higher priority than competitive pricing or ease of payment. Michael Klein, head of industry strategy for Adobe, presented this data and said “The addiction to discounting needs to be broken, a race to the bottom of the price wars benefits no one. Build better experiences to create more sustainable customer relationships." Andy Katz-Mayfield, Co-founder and Co-CEO of Harry's, a boutique ecommerce shaving company, advised, "Customers don't think about channels or offline vs. online. Let customer's desires and needs define where they shop and discover your products." But meeting all your customers' needs is no easy feat. In addition to creating good expereinces and providing responsive customer care channels, for many brands and retailers it has also come down to fast and effective delivery. 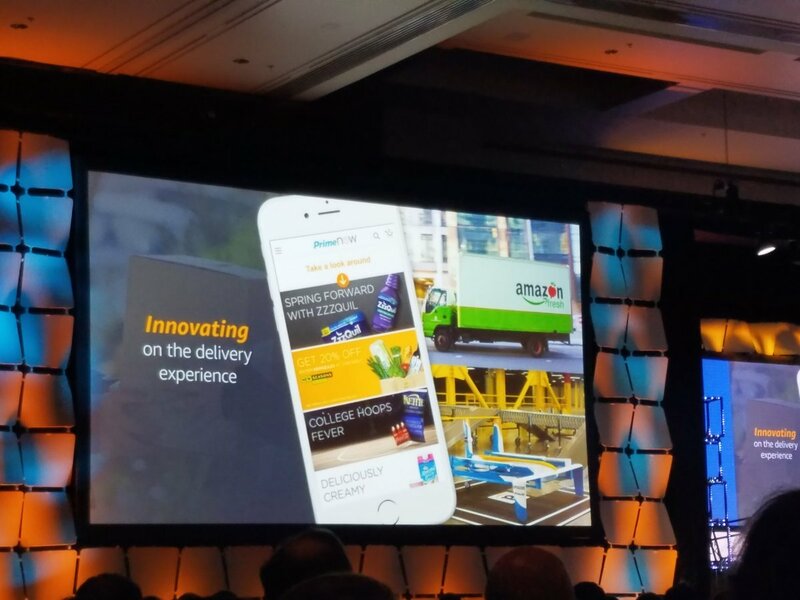 Stephenie Landry, VP of Amazon PrimeNow, said that ten years ago Amazon customers were content to wait two weeks for books, today they’re okay with two days, but the future will be a two hour delivery time. Her team is tackling this mandate head on. Likewise, eBay announced it is launching a three-day guaranteed delivery time product later this year to be more competitive and meet consumer expectations. Our biggest takeaway from all of this? Distributed commerce is here to stay and the investments brands and retailers are making are all in support of meeting the demands of today's on-the-go, in control shopper. At this year's show, "distributed commerce" was more than a simple buzzword. It is clear that customers now browse, shop and buy anywhere. They expect to be able to interact with your products anywhere, pick up and deliver products anywhere. Mindy Grossman, CEO of HSN, said, "The new world is distributed commerce – audience centric and platform agnostic." How is your organization tackling this new world of retail? What are your investment priorities and how are you meeting consumer demands? We recently asked brands and retailers to share their priorities in our new eBook, Win the Sale. Download your copy now.